While on the CRM newsgroups, I frequently see questions about the CRM Address Book Provider. Here are answers to many of those questions in a FAQ format. Q – What is the CRM Address Book Provider and what does it do for me? 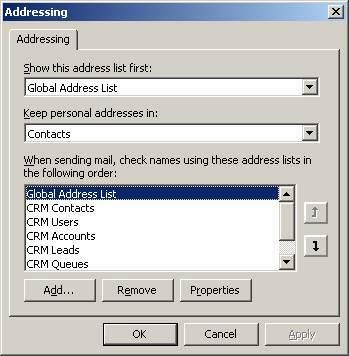 A – The CRM Address Book Provider adds a set of lists to the Outlook Address Book containing your CRM record data. The CRM entities that are included in the Address Book are Accounts, Contacts, Facilities/Equipment, Leads, Queues, and Users. You can use the entries in these lists as recipients in an Outlook email or a meeting request. For example, just click the ‘To…’ button on an Outlook email to open the Outlook Select Names dialog and you can choose CRM records as recipients. Additionally, there is a custom property page for the entries that includes a button labeled ‘Open in CRM’ to open the web form for the corresponding CRM record to view additional information. 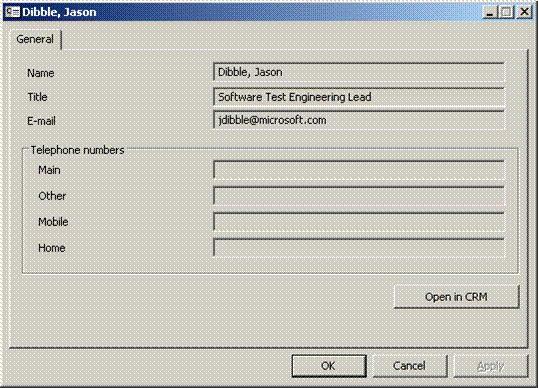 You can even use Outlook’s name resolution feature to resolve partially entered names to CRM records. Q – Why don’t I see all of my records listed in the CRM address lists? A – Only CRM records with the primary email address field populated will appear in the Outlook Address Book lists. All records that a user can view per their CRM security role will be synchronized to the Address Book lists. Q – Why don’t I see new records I created in CRM show up in the CRM address lists immediately? How is the sync schedule setup? A – The CRM Address Book Provider sync mechanism is decoupled from the other CRM Outlook client sync mechanisms (Offline sync and activities/contacts sync to Outlook). The Address Book sync mechanism occurs in 2 ways, during startup of the CRM Outlook client and every 20 minutes while the CRM Outlook client is running. The reason for this is to minimize the performance impact against the CRM server. The sync mechanism cannot be triggered manually. Q – How can I email a contact from Outlook directly after creating it in CRM? A – You have 2 options here. Either you can select the contact from your Outlook Contacts address list in Outlook (the contact will sync to this list as part of the CRM to Outlook sync process) or you can manually enter the email address into the recipient field. Q – When I view the CRM address lists in the Address Book, I don’t see any records, why? 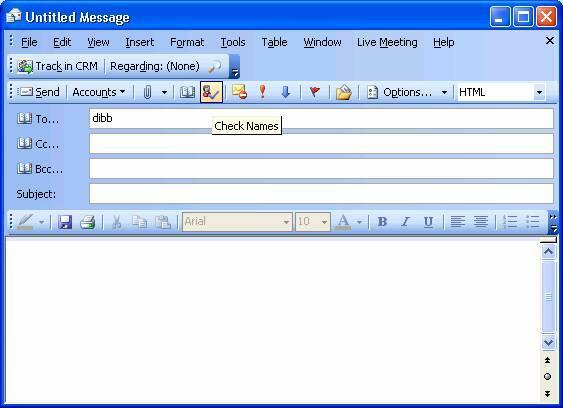 A – This can occur if you have a large data set in CRM and you do not leave the CRM Outlook client open and running for a long enough period of time for all of the records to sync to the Address Book. The sync process is an all or nothing process, the records do not sync in batches. So, if you have a large number of records, it may take some time for them all to sync to the local client cache. Q – It appears that my CRM address lists are corrupt, is there a local cache I can clear out to fix this? A – Yes, there is a local cache of the CRM Address Book data. If you clear out the cache files, they will regenerate on the next CRM Address Book sync. The files are in xml format and are located in the Online/Offline folders under <userprofife>\Application Data\Microsoft\MSCRM\ABP\. Delete the xml files you find here and restart Outlook to regenerate them. Q – On a email recipient field, when I type in part of a recipient’s name and click the check names button Outlook resolves the recipients to a record in the CRM address list and I wanted a record from another list (or vice-versa). How do I change this? A – By default, the CRM Outlook Client install set the name resolution order to be the Global Address List, the CRM address lists, and then your Outlook Contacts list. You can easily change this resolution order to fit your needs. Open the Address Book in Outlook, and select Tools > Options from the menu. Change the order of the address lists to fit your needs under the ‘When sending mail, check names using these address lists in the following order’ area. 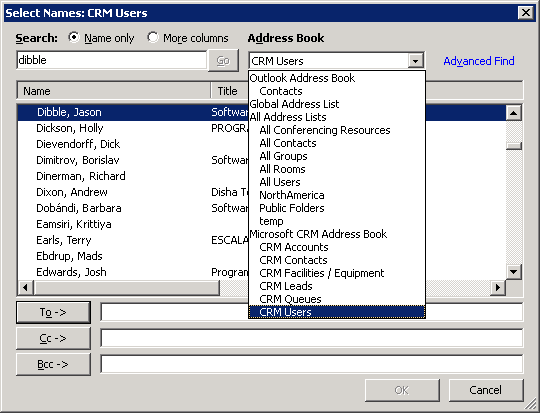 Q – Does the CRM Address Book provider support customizations? A – Out of the box, customization to the CRM Address Book provider (adding additional lists/fields or displaying renamed entity names) is not supported. Look for enhancements in this area in future releases. However, customizations applied to the CRM web form can be viewed by choosing the ‘Open in CRM’ button from the address entry property page. Let me know if you have other questions I didn’t address. See you on the newsgroups.